It’s Christmas season, and praise the Lord for this episode. Bob’s Burgers finally introduced us to Bob’s dad, Big Bob (Bill Hader), last night. It’s been almost a decade since Bob has attended his dad’s annual Christmas Eve party at the O.G. burger joint — which looks a helluva lot busier than his place — but this year, Linda convinces the family to go. Some traumatic memories are rehashed and some new ones are created as Bob and his notoriously controlling father cook the holiday away. While their parents (and grandparent) man the restaurant/party, the kids endeavor to create contest-winning Christmas presents for their dad, each with their own lovable twist. Tina: A calendar of Australian firefighters holding puppies in casual settings. Louise: An internship at Santa’s company, preferably in the flying-animal or breaking-and-entering department. Bob: We just went two years ago. Gene: I remember. I was still breastfeeding! In the car ride over to Pop-Pop’s, much was revealed: Linda wanted a hip-hop-yoga dance video for Christmas, Tina has been having a very busy holiday season, and YOU CAN’T PUT SORRY UNDER THE TREE. Tina: Grandpa, you don’t look a day over Grandpa age. Grandpa: You’re a doll, Tina. Gene: Dad loves to drum on beans, right? Tina: What about this chair? Dad sits sometimes. Louise: Boring. He’ll sit when he’s dead, Tina. What if we glue all these mousetraps together and call it a supertrap? Tina: What if I make my chair a superchair? Like if I tape this pad of paper to it, then he can journal! Tina: Dad’s chair’s almost done! He’ll never have to stand up again. Dad’s thirsty? He’s got a water bottle. He’s cold? He’s got a box of matches. Now he’s bored? Not anymore, here’s a basketball. And then I can use this dishtowel to wipe the floor with you, because I just won the MistleTony … How’s your present going, Little Drummer Gene? Beans, beans, the tragical fruit, the more you drum it, the more you lose? The contest we’re in right now? Gene: You can’t hurt me, Tina. At this point, I’m more bean than Gene. Tina: What could be better than a battery, taped to the back of the chair? Tina: When a mysterious cowboy-slash-Santa says, “Come with me,” you climb on that horse and ride. Gene. Tina, as usual, put up a good fight, but Gene reigned supreme. He took a bath in beans and then peed in it. Nothing says “Feliz Navidad” like pee beans and an MVP trophy. So Merry Christmas, Gene. I inexplicably miss Dr. Yap. Nick Offerman was really fantastic in this episode. Come back soon. 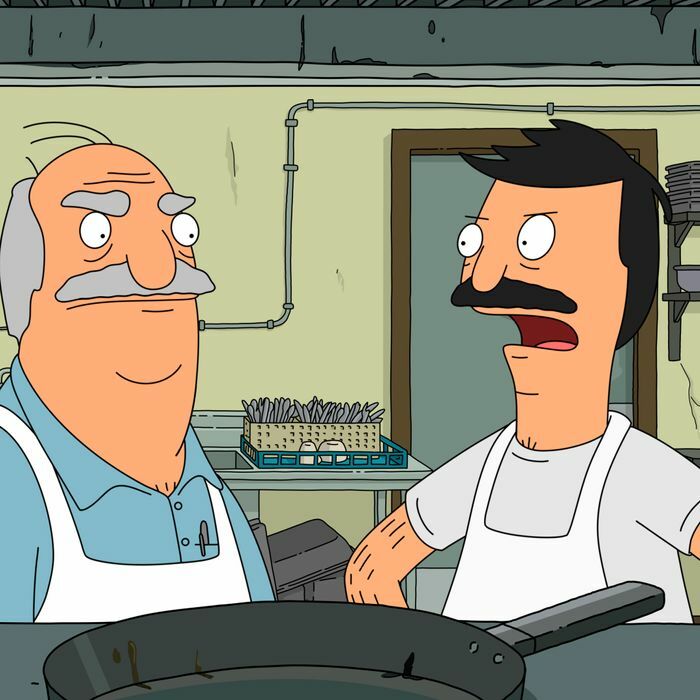 Big Bob’s mustache was legendary (like father, like son, clearly). It looked like the drug dealer from High Maintenance made a cameo at Big Bob’s Christmas Eve party.